triproberts12 - Thanks for the advice! Oh man, I forgot about mana doublers. Definitely finding a spot for those. Pir's Whim could be cool, I didn't realize you could find ANY land. Do you think it would replace Tempt with Discovery , or should I keep both? 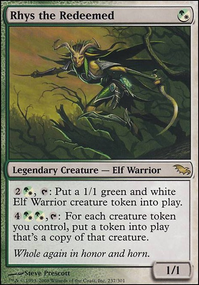 Yeah, maybe Collective Voyage could replace Animist's Awakening . It would definitely be more consistent and give that early game boost. Land/ Ramp- people have told me i have to few lands, with too few ramps, I get that a lot. In playing people I actually haven't had any trouble with mana surprisingly. I do have 13 ramps, and 4 that turn all my lands into multiple colors... Chromatic Lantern , Riftstone Portal , Urborg, Tomb of Yawgmoth , and Mycosynth Lattice (Mycosynth lattice is a funny one that allows me to destroy everyones lands). I should still probably add Sol Ring like you said, it seems to be a staple and pretty good. 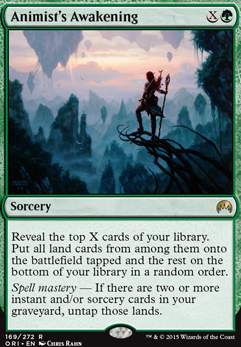 There is mostly basics because well not just blood moon but i have a combo in the deck Scouting Trek + Animist's Awakening that allows me to pull all my basic lands out at once, and untapped. Could be a good combo or not it really is up to personal perspective i guess? I like the idea of mana dorks, I just sac everything so i don't use them. Mostly i try to have every card in the deck have a double use.. at least trying. Deathrite Shaman I just like this card and should add it you are right. Eladamri's Call I am not actually aware of why i haven't included this in the Deck its a cheap tutor. Scavenging Ooze I don't know why this isn't in the deck. Procrastination i guess? ha it's a killer card. These are just some reasonings behind what i do if you have any feedback on the reasonings i am more than happy to have an open mind. Im all eyes. I would like to know also what you would have cut. Another list I'm in love with that I find out is by you. Animist's Awakening spell mastery is super easy to attain in this deck. Brings any land into play and we love copying X spells right? With a nice enough X and a big enough hit you most likely could follow this up with more ramp. 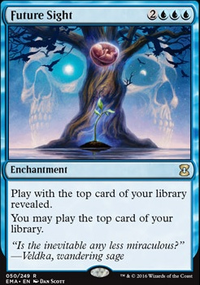 Collective Unconscious 1 more mana than shamanic revalation but still a good effect for draw in a token deck. 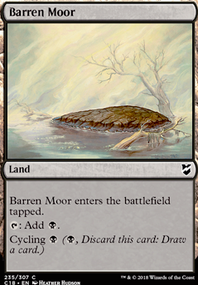 Treacherous Terrain it's no X spell, but it hits everyone for a decent chunk, especially when copied and combos with.. I think that's probably enough things to think about for now haha. Hey, I love hydra theme decks. I build one myself. Here the link if you want to check it out: Hydra Warlord. 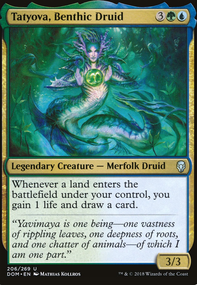 I think Ulvenwald Hydra , Primordial Hydra , Managorger Hydra and Whiptongue Hydra are also great hydras which will fit in your deck. 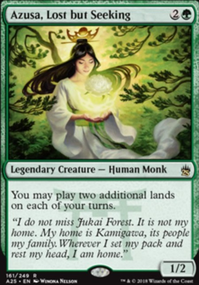 Rishkar's Expertise , Hunter's Prowess and Elemental Bond would be great card draw spells in this deck. 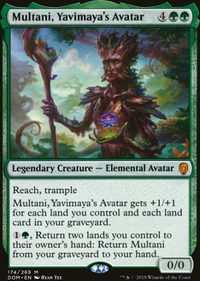 Animist's Awakening would also be a great fit for your deck because you run so many lands. Heroic Intervention and Inspiring Call are great cards to protect your board. With so many big creatures a board wipe will come sooner then later. 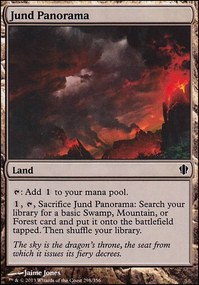 Traverse the Outlands and Harvest Season can both get lots of lands in play at once for cheap. If you have a ton of mana maybe try Genesis Wave and Animist's Awakening too. Collective Voyage and Tempt with Discovery do it for everyone, but you get the effects at a discount.